Julia Hansson attended the 2016 U.S. Sumo Open on a date. When it was time for the women’s openweight competition, Hansson figured it was open to any and all competitors, so she began approaching the mat wanting to wrestle, only to be reined back. 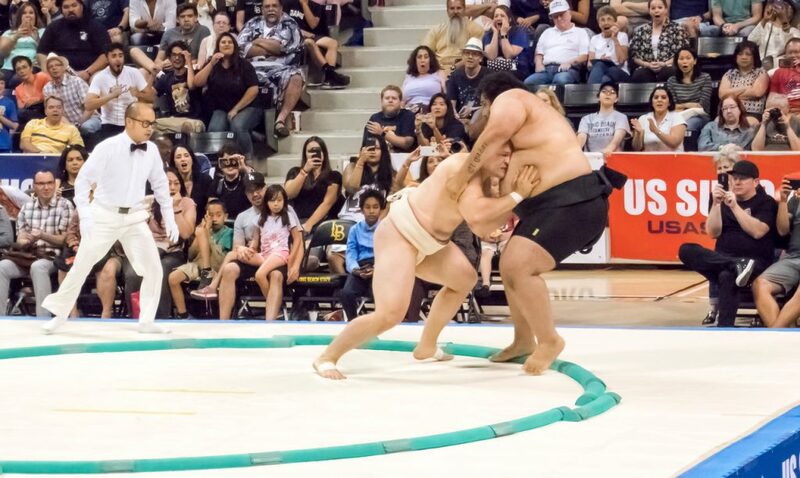 After vowing to return to the tournament as a competitor, Hansson was back at Walter Pyramid on the campus of California State University, Long Beach, for the 17th annual U.S. Sumo Open on June 17. The Swede went from spectator to champion, going undefeated on her way to the women’s lightweight title. Founded in 2001 by Andrew Freund, the U.S. Sumo Open is the largest and longest-running sumo competition in the world outside of Japan. The event features more than 50 sumo wrestlers hailing from around the globe, including the United States, Japan, Norway, Mongolia and Egypt. Ramy Elgazar (6-foot-3, 459 pounds) won a bronze medal in the men’s heavyweight division. The Egyptian has been participating in the U.S. Sumo Open since 2015. Mongolian Byambajav Ulambayar (6-1, 353) won heavyweight gold for the 10th time in 11 years. Japan’s Takeshi Amitani (5-7, 245) won middleweight bronze and gold in openweight, becoming the first non-heavyweight to win the openweight title since 2002. American Trent Sabo (5-8, 187) won the men’s lightweight division. "Do you get waves in England?" If Harry Timson had a dollar— well, maybe a pound would be more fitting — every time he was asked that question, he’d have a lot more extra cash to spend as he travels the world as a professional surfer for Volcom along with fellow international riders like Mauro Diaz and Leon Glatzer. Wimbledon is the oldest tennis tournament in the world. It has been played at the All-England Lawn Tennis & Croquet Club in Wimbledon, London, since 1877. With so much history, it's no surprise the tournament is also full of tradition.